I teach at a HS that for decades was in the top 5% of high schools in our state. Last year we were in the top 15% for our state science scores yet over half of our students were not proficient by the state standards. By 2014 all 100% of our students must be proficient. In our haste to improve our scores we have turned our classrooms into places where these state exams are talked about all the time. Valuable instructional time (that should be used to work on inquiry skills) is spent worrying about state tests. Lost in the confusion are the students, the joy of learning and the joy of teaching. The emphasis on test preparation HAS revealed a lack of interest and effort on the part of the students. They have very little stamina when it comes to reading the test questions and they have poor reading skills to begin with. Here is a question from a benchmark Study Island assessment that is supposed to mirror the types of questions that the students will see on the state test. Most of my students got this wrong. The students were very clear that they “gave up.” They all complained that this was “so much reading.” When I write questions like this on my own assessments I find the same thing. The students just don’t have any “stick-to-it-ness.” Many students have grown accustomed to assessment questions that are short and sweet and never rise above lower order thinking skills. I don’t see this changing anytime soon. What are the rest of you seeing? Of course you did and so did the world. XYZ Advertising – getting the word out. It is nice to be back. It’s time for a change. I want to try to keep Rox for Brains an active site for me. I have taken a huge break from writing on this blog but not a break from blogging. As part of a professional development target (goal) this year I maintained a class blog for both of the high school courses that I teach. 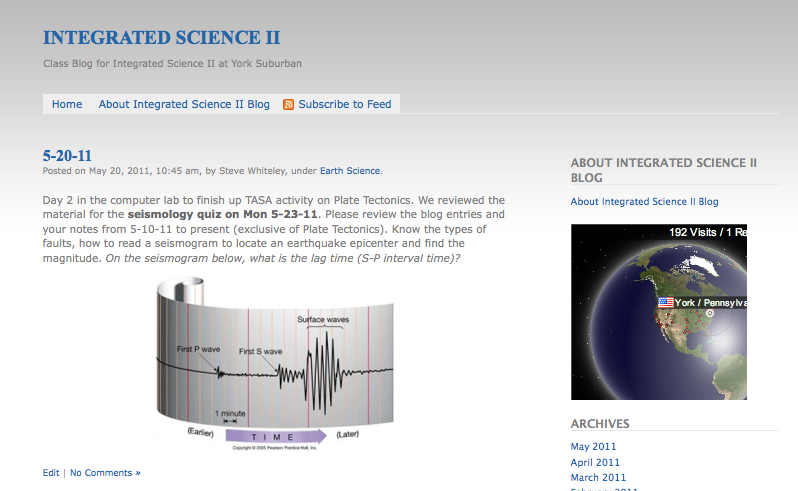 Blogs for Astronomy and Integrated Science II provided students with a summary of what was covered in class. I embedded photos, linked to other helpful sites, added videos, provided links to class handouts and assignments, and posed questions. With 15 days left in the year I have written 340 (2 x 170) entries. The students soon understood that the blog was a great place to go for review (look over the posts from 5-10-11 to 5-18-11 for the seismology quiz for example). Allowing them to comment meant we needed to discuss what it means to submit germane and responsible posts. Will I continue to do it? You bet. A colleague of mine shared a site that will me to archive the blogs so that next year’s students can have entries that are not recycled and don’t seem canned. Can I live without blogging? Apparently I can live without blogging as my last entry was a year ago. Quite honestly I have not had much to write about that I thought the world needed to know. I have been working hard to incorporate the use of technology into my lessons at school (if and when it serves to enhance instruction and learning) as I am one of a few teachers who has 1:1 (one laptop wireless computer available to each student any and all class periods). No more signing out the computer lab or the cart. No need to plan a lesson that is all or nothing in terms of computer use. We can now use them when we want for as little or as long as we need them. I have continued to use Twitter and Facebook as ways to stay connected to others socially and professionally. In all likelihood, you are reading this because I posted a link on those sites. OK , I spelled Apple wrong on purpose. Spent the weekend in NYC and had fun reading the amazing number of signs in the city and counting the Starbucks that one can see from one vantage point. Here are two of my favorites. This won’t take long. Forgot that I snapped this photo last year as we were clearing out the stuff in the beach house before it was torn down. Always joke in our family about a summer trip out west when we were in Salida, CO and the street names were letters. Someone lives on the corner of F and Walnut, F and Elm, F and Broad–you get the idea. So . . . this vacuum bag just tickled my fancy and brought back memories of that trip. Any teachers out there know that you never have these two letters spend any time together and you never go from X to C! Today my four geoscience classes conducted one of my favorite activities of the year. It is so simple yet evokes such wonder and interest in the students. They simply investigate how two fluids of different densities (hot red water and cold blue water) interact. The preceeding day they had diagrammed warm and cold fronts. 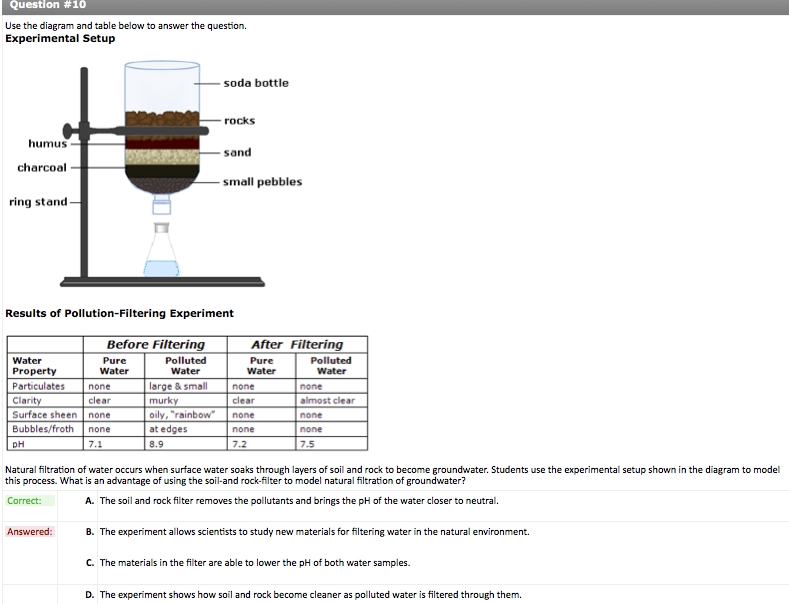 They come away from this activity fully understanding that fluids of different densities DO NOT mix easily. They have to diagram the set up before pulling out the divider and then draw an “after” diagram. They have to make predictions and support their ideas and then get to “test” their predictions right away. After the blue slide under the red, they reinsert the divider, mix the one side (to produce warm purple water) and go again. There is often a chorus of “that’s sick Mr. W,” which I know means they are finding the experience interesting.